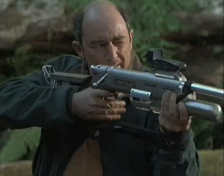 All-activity vehicles, also known as AAVs, were produced by Eddie Carr for use on Isla Sorna by Ian Malcolm, Sarah Harding, Nick Van Owen and Carr. At least a pair of AAVs were brought on the expedition to Sorna. Eddie’s all-activity vehicle was equipped with a winch. The AAVs were designed to cover any terrain they could encounter on Isla Sorna. Carr used one of the vehicles for transportation while he erected his High Hide; the other was used by Nick and Sarah to transport an injured baby Tyrannosaurus rex to their research trailers after sabotaging the hunter camp. Eddie used his AAV to delay the destruction of the research trailers so that Sarah, Ian and Nick could escape via rope. The two Tyrannosaur parents of the baby killed Eddie and destroyed the AAV during the rescue attempt. With Eddie’s AAV and the trailers destroyed, the remaining equipment–including AAVs–was abandoned by the group.